Can Tho (VNA) – The APEC 2017 Food Security Week and a High-Level Policy Dialogue on Enhancing Food Security and Sustainable Agriculture in Response to Climate Change kicked off in the Mekong Delta city of Can Tho on August 18. The event brought together nearly 1,500 delegates from APEC member economies, international organisations and research agencies. During the week, there are dialogues on responsible use of natural resources in order to increase food production and sustainable agriculture business between ministers and CEOs. 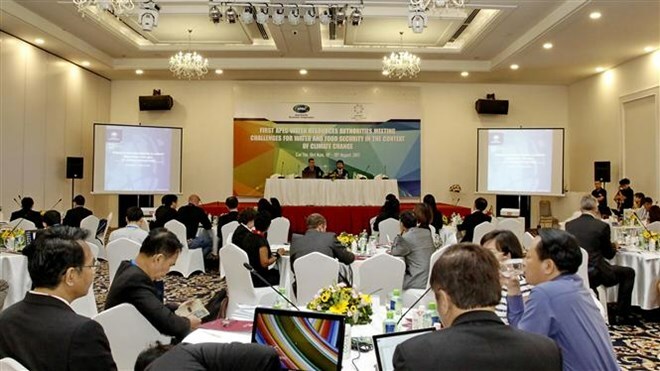 The event also features annual meetings of APEC working groups such as the Policy Partnership on Food Security (PPFS), the Ocean and Fisheries Working Group (OFWG), the High-Level Policy Dialoged on Agricultural Biotechnology (HLPDAB), and the Agricultural Technical Cooperation Working Group (ATCWG), and a meeting of the four above-mentioned groups. Apart from symposiums, an agriculture forum on start-up and innovation and an exhibition displaying farming products of Vietnam and foreign countries, participants will have a chance to make fact-finding trips to several farming models in Can Tho and the Mekong Delta province of Dong Thap. The event is expected to approve an action plan implementing the APEC framework programme on food security and climate change, another action plan implementing the APEC strategic framework on sustainable rural-urban development to strengthen food security and quality growth, and the Can Tho declaration on enhancing food security and sustainable agriculture in response to climate change. Ensuring food and nutrition security, and reducing poverty are meeting a range of difficulties, especially in developing countries.